The Grade 3, $700,000 Kentucky Downs Turf Sprint has been selected for the 2019 Breeders’ Cup Challenge Series, providing Kentucky Downs its first “Win and You’re In” race as a launching pad to horse racing’s global championships. As part of the Challenge Series, the Kentucky Downs Turf Sprint winner will get an automatic berth and waiver of the $30,000 in entry fees to the $1 million Breeders’ Cup Turf Sprint (G1) on Nov. 2 at Santa Anita. A travel stipend is included for Challenge Series winners based outside of California, with $10,000 awarded for North American horses and $40,000 for international horses. The Kentucky Downs Turf Sprint shapes up as America’s richest race for the grass sprint division outside the Breeders' Cup, with a $500,000 in base purse available to all horses and an additional $200,000 available to Kentucky-bred horses through the Kentucky Thoroughbred Development Fund. The stakes’ distance has been shortened from 6 1/2 furlongs to six furlongs. The gross purse for the 2018 Kentucky Downs Turf Sprint was $500,000, with $300,000 base money and $200,000 in KTDF supplements. “We’ve aggressively pursued getting a Breeders’ Cup Challenge Series stakes the past couple of years, and this is a very big deal for us,” said Ted Nicholson, Kentucky Downs’ senior vice president and general manager. “Having the Kentucky Downs Turf Sprint as a ‘Win and You’re In’ for the Breeders’ Cup Turf Sprint provides great incentive for horsemen to run here in addition to the huge purse we are offering. We look forward to working with the Breeders’ Cup to recruit European horses and to make this an exceptional event for all participants, coming on a day when the eyes of the racing world will be on Kentucky Downs. The Kentucky Downs Turf Sprint will be run Saturday, Sept. 7, as part of a blockbuster card featuring five stakes. 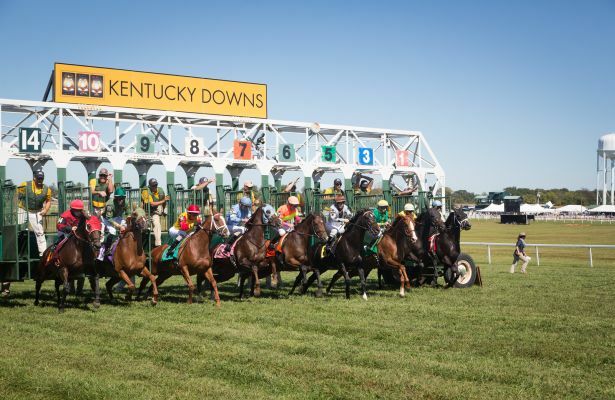 A Kentucky Downs record-shattering $10,039,008 was wagered on that Saturday in 2018. The track's 2019 stakes schedule will be released soon.